Mandatory water use restrictions are now in effect for customers throughout the Coastal Bend region. Lake levels slipped below 40% of total capacity in early July triggering Stage 2 of the Drought Contingency Plan. These restrictions apply to all customers who get their water from the regional supply system that includes Lake Corpus Christi, Choke Canyon Reservoir and Lake Texana. The primary additional restriction in Stage 2 is that sprinkler irrigation of lawns and landscaping is limited to one-day-per-week. In most area communities, but not all, that day is the same day as the customer's weekly garbage collection. This is a mandatory restriction. 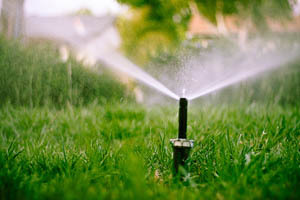 >> Use of lawn sprinklers for irrigation between 10 a.m. and 6 p.m. is prohibited. >> No person shall allow water to run off property into gutters or streets. >> No person shall allow water to flow constantly through a tap, hydrant or valve. >> Defective plumbing resulting in water loss must be repaired. >> No person shall use any non-recycling decorative water fountain. >> An irrigation system cannot operate at water pressures that cause misting. >> Restaurants must only serve water upon request. Mandatory Stage 2 restrictions were triggered when the combined levels of Lake Corpus Christi and Choke Canyon Reservoir (LCC/CCR System) dropped below 40% of storage capacity. Stage 3 would be triggered if water in storage drops below 30%. Stage 4 would be triggered at 20% of reservoir capacity and would be considered CRITICAL Water Shortage Conditions. Stage 5 would be an extreme emergency. 1. Irrigation of landscaped areas with hose-end sprinklers or automatic irrigation systems shall be limited to once per week and is prohibited between the hours of 10 a.m. and 6 p.m. The designated watering day for each residence is determined by the local city or water provider. For all San Patricio Municipal Water District direct retail customers the designated day is Saturday. However, irrigation of landscaped areas is permitted on any day if it is by means of a hand-held hose with positive shut-off nozzle, a faucet filled bucket or watering can of five gallons or less, or a drip irrigation system with a positive shut-off device. Customers irrigating with an irrigation well should provide a legible sign prominently posted on the premises within two feet of the street number located on the premises. 2. 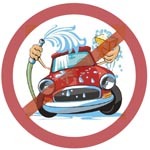 Use of water to wash a motor vehicle, motorbike, boat, trailer, or other vehicle is prohibited except on the designated watering day for that residence or business. However, washing of boats/and or flushing of boat motors is permitted upon immediate exit of a water body. Vehicle washing may be done at any time at the premises of a commercial car wash.
3. Use of water to fill, refill or add to any indoor or outdoor swimming pools, wading pools, or Jacuzzi-type pools is prohibited except on your designated watering day. 4. The use of water to maintain the integrity of building foundations is only permitted by use of a hand held hose or drip irrigation. >>Use of water for dust control without permit granted by the appropriate public water provider. Each city government or water provider may impose additional restrictions and is responsible for notifying customers and for enforcement. Various enforcement mechanisms are being used including the potential for disconnecting water service for repeat offenders. Water District customers include the cities of Odem, Taft, Gregory, Portland, Ingleside, Aransas Pass, Rockport and Port Aransas, Rincon Water Supply Corp., Seaboard Water Supply Corp. and several industrial customers.